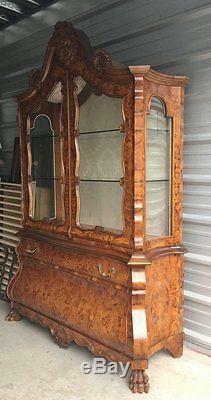 DUTCH INLAID / MARQUETRY SATINWOOD BOMBE DISPLAY CHINA CABINET, H 98", W 62", D 25.. The top having carved shell and scroll form pediment, flanked on each side by smaller similar pediments; above a pair of glass doors. Which are surrounded by a slightly scalloped frame, with carved floral motif along the edge. Opening to reveal three shelves, and a damask covered interior. The base having a full length drawer, and pair of cabinet doors. Ending in a scalloped apron with carved shell motif in the center and resting on lion paw feet. LOCATED AT MY HOME IN NEW JERSEY, ZIP CODE 08831. ALL ITEMS ON MY SITE ARE GUARANTEE TO BE 100% VINTAGE, AND NOT REPRODUCTIONS. The item "VINTAGE DUTCH INLAID / MARQUETRY SATINWOOD BOMBE DISPLAY / CHINA CABINET" is in sale since Tuesday, December 08, 2015. This item is in the category "Antiques\Furniture\Cabinets & Cupboards\1900-1950". The seller is "original-picker1" and is located in Staten Island, New York. This item can't be shipped, the buyer must pick up the item.